If you like British comedy, we've got a classic this week that's quite the ticket. 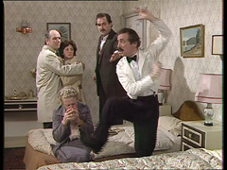 We'll take a close look at Watery Fowls -- er, Fawlty Towers -- the show deemed the greatest of all time by the British Film Institute. Will this 70s television treasure still shine today? Can the operatic virtuosity of Cleese and company overcome Hannah's antipathy for farce? Will Jeffrey talk at length about Monty Python? Tune in to learn more about the charms of Torquay, the peculiar British tradition of video in/film out, and where you can experience the glamour of dinner à la Fawlty. But whatever you do, just don't mention the war.